Who doesn’t love Laser Tag? 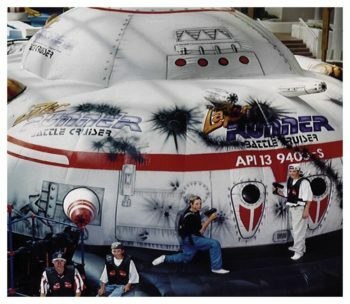 When you rent our huge Lazer Tag Runner Inflatable Battle Cruiser you are going to love it even more. You enter the Laser Tag arena…WAIT…WHAT’S THAT NOISE? Suddenly, a fiery scarlet tracer appears on your chest – somebody has you in their sights! Through the haze you spot a Battle Phaser at Point Blank range. You drop behind cover, and in a split second you’re lying facedown with your finger on the trigger… pounding a shower of crimson laser rays from your Battle Phaser. You score a direct hit! The enemy’s fiber optic Battle Vest pulsates, delivering the bad news—deactivation! Their phaser is de-energized for five seconds, then the action starts over again.